Your organization is storing documents and emails in SharePoint – perhaps to replace file shares, or to improve upon personal Outlook folders as a way of managing emails, or maybe even to replace a traditional DM system. One of the reasons for moving to SharePoint is that it has a powerful search capability – you can search for documents based on their content and / or their metadata. How ironic then that one of the complaints that I hear most frequently from users who are trying to manage documents and emails in SharePoint is that the searching is far from user friendly. In this post I’ll look at how MacroView DMF® lets users search for documents in SharePoint the way they really want to. The Out-Of-The-Box SharePoint search page is the source of these user frustrations. That web page lets you search for documents based on words that they contain (or do not contain) but if you want to search by custom metadata you have to pick search properties from a drop down list and key in value criteria. It’s a very utilitarian user interface and nothing like the profile-based searches that you get with a traditional DM system, where the search dialog has specific controls that correspond to the metadata attributes that are relevant within the organization. Some users find that the way the search results are displayed by the OOB SharePoint search browser UI is also frustrating. What they would like is a grid-style display of results, so that it is easy to see the key metadata for each search result, with each search result on a separate line. Instead the OOB search result display shows a paragraph for each result, which includes a précis. Instead of this précis, users would prefer to be able to quickly see formatted previews of the search result document, or at least the first page or so of each such document. Can We Fix This With Custom Search Pages? Some organizations try to address these frustrations by creating custom web browser pages to replace the OOB SharePoint search browser page. Some of the resulting custom search centers are quite attractive (and expensive), but sadly they do not address the most frustrating aspect of SharePoint searching for DM users – which is that you have to leave the application where you are working (e.g. Microsoft Outlook or Word or Excel) and jump into the browser in order to do your searching. The problem is not just that you have to jump around between applications. Imagine yourself drafting a new email in Outlook. If you want to search for a document in SharePoint that you would like to include as an attachment (or as a link) you jump out to IE (or other web browser), perform the search and then see a list of search results. When you are working with SharePoint , to get one of those results into your Outlook email you need to save it somewhere temporarily (e.g. on your Desktop) then go back to Outlook, click Insert or the paper clip icon and find the temporary copy then insert it and ideally delete the temporary copy. It is a little better in SharePoint 2013 as you can select a few documents and drag them into your email message. However inserting links to your documents (rather than the whole file) can only be done one at a time in all versions of SharePoint (right-click on the file in IE, Copy shortcut and paste it into your email, then do the next one). What users really want to be able to do is to perform the search while they continue to work in Outlook, and be able to click on a search result and have the corresponding document inserted either as a link or as an embedded attachment. To do this search and retrieve users do NOT want to have to go to the web browser at all – regardless of how customized the search center pages might be. MacroView DMF (Document Management Framework) is a SharePoint add-on that extends and enhances the native document management capabilities of SharePoint to enable SharePoint-based DM solutions that are effective and popular with users. To meet this objective, MacroView DMF provides a document search experience that is dramatically more user-friendly than the OOB SharePoint search. Importantly MacroView DMF lets you search SharePoint while you continue to work in Outlook, Word, Excel, PowerPoint or Adobe Acrobat and while you are managing documents in a separate Windows application called MacroView DMF Explorer. The search-for-and-insert-attachment scenario described above is definitely not a problem. Search mode is one of the modes that MacroView DMF provides to let you interact with the SharePoint document environment. In Search mode you can select the type of search you want to do. MacroView DMF ships with Email Search and Keyword Search, but by editing an XML definition file an organization can create additional Search Types that reflect the metadata that they are using, even the way various departments or practice groups want to search. Choosing a Search Type displays a panel that has controls for specific metadata attributes – just like the profile-style search facilities in a traditional DM system. The screen shot below shows using the standard Email Search panel being used to search for emails that are stored anywhere in SharePoint and whose To column value contains noel and where the content of the email contains the word called. The screen shot shows the first page of search results – and also a formatted preview of a selected search result. The columns that appear in the search results display can readily by configured by editing the XML definition file. 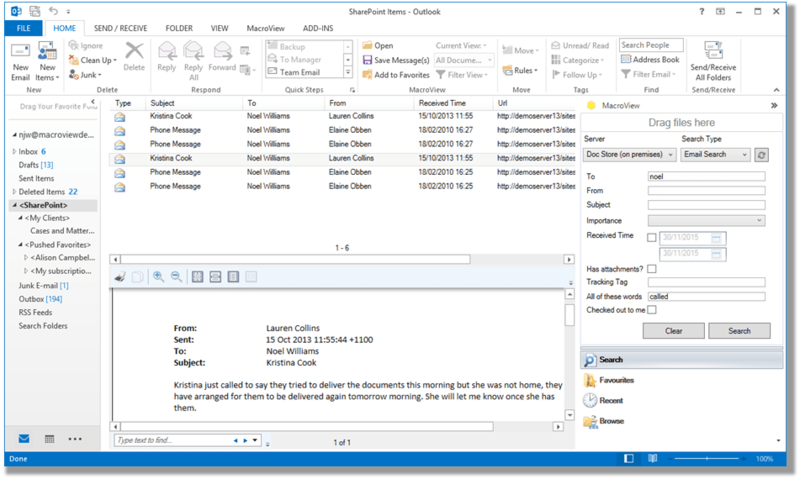 The screen shot shows the shipped configuration, which contains columns for Subject, To, Received, etc – much like your Outlook InBox. Speaking of Outlook, note how this email search has been performed from the MacroView pane within Outlook. MacroView DMF lets you save a search as a Favorite, so that you can easily run it again in the future. MacroView DMF also remembers (and lets you easily re-run) your recent searches. When you right-click on a search result you see a rich right-click menu. Choosing the Open File Location option on that menu will jump you into the Browse mode of MacroView DMF, located on the document library wherein the search result is actually located. I find myself using this feature very frequently, because once I find one document for a project or transaction, Open File Location lets me easily see all the documents that are stored for that project or transaction. A vitally important point is that MacroView DMF improves the user interface for searching the SharePoint environment, but does not change how SharePoint stores or indexes documents. Behind the scenes MacroView DMF performs the search by sending a query to the SharePoint search engine (or to FAST Search for 2010 if it is deployed). If the Search engine is SharePoint 2013 or FAST you will see Refiners appearing in the MacroView DMF Search panels. MacroView DMF automatically trims the search results so that they contain only documents – web pages and list items are not shown. Right-click on a Site Collection, Site, Document Library, Document Set or Folder in the SharePoint tree displayed by the MacroView DMF Browse mode and select Search This Location – this will restrict the scope of the search to just that area of SharePoint. Select an ordering for your Search Results – e.g. by Modified Date rather than the default Relevance. The enhanced search experience provided by MacroView DMF is also available in products that are based on MacroView DMF – such as MacroView Message and MacroView Case & Matter. For more information about how MacroView DMF enables effective, user-friendly document management and email management solutions on the SharePoint platform, see the MacroView DMF product page or email solutions@macroview365.com.